Bobby Alvarez majored in the Program of Liberal Studies and minored in Peace Studies. In the summer of 2012, he spent two months on an ISSLP serving and living at La Finca del Niño, an orphanage in rural Honduras. While there, he taught math, science, and English to 3rd and 4th grades, and taught math to 7th, 8th, and 9th grades. Bobby also had a brief stint working with the maintenance crew. When school was out, Bobby played fútbol with the kids, harvested coconuts with the ositos (cub scouts), went on hikes with the boy scouts, baked in an outdoor oven, and sampled the Finca's garrobo (i.e., lizard) fare. Mary Jeanne is a member of the class of 2013 from Mountain Top, PA; she majored in Anthropology and Spanish. She spent her summer of 2012 in Puno, Peru through the ISSLP, where she worked at the Universidad Nacional del Altiplano supporting English classes and Campus Ministry. During her time in Puno, she was able to experience first-hand some of the local and human effects of the global development rhetoric that dominates the conversation of the present-day third world. She owes most of her learning and insights to the wonderful friends that she made in and out of the classroom, who were always more than eager to share with her their culture, beliefs, opinions, struggles, and hopes for the future. Lisa Chin studied Psychology and Poverty Studies at Notre Dame. 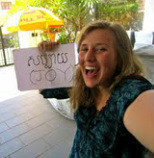 Through a Kellogg Internship, she worked as a volunteer teacher in at the Ongha Senior Secondary School in Namibia. She volunteered for ten weeks through WorldTeach, an organization that partners with the Ministry of Education to provide teachers for schools in rural villages. She taught computer classes to students in grades 8-12, conducted teacher computer training, assisted students in publishing the school magazine, and participated in extracurricular activities with the kids. Her favorite experiences while in Namibia included singing and dancing performances by the school's cultural group, "braiing" (barbecuing) with her colleagues, and learning a bit of the native language, Oshikwanyama. Elizabeth majored in Sociology and Pre-Medical studies at the University of Notre Dame. Over the summer of 2012, she traveled to Antigua, Guatemala through the International Summer Service Learning Program (ISSLP) sponsored by the Center for Social Concerns. During her eight-week stay, Elizabeth volunteered as an intern at the Familias de Esperanza (Common Hope) medical and dental clinic. She assisted clinicians with a number of medical procedures and also supported the doctors in the mobile unit, which visited rural homes and schools to teach public health and give personalized medical treatment. Kristen Durbin majored in American Studies and pre-health major at Notre Dame. In summer 2012 she spent eight weeks in San Julian, El Salvador, through Notre Dame's International Summer Service Learning Program (ISSLP). Kristen worked with a Salvadoran NGO, Fundacion Salvadoreña para la Salud y el Desarrollo Humano (FUSAL), as a volunteer with a medical team. On a daily basis, Kristen traveled to one of five different rural communities near San Julian and led educational sessions on nutrition and childrearing for mothers, distributed food and medication and helped monitor the height and weight of children in the communities. Another major component of Kristen's summer was her cultural and historical education about El Salvador at the hands of Gene Palumbo, her mentor and an American journalist. rural village outside of Kampala. 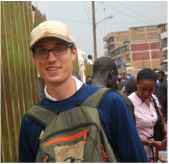 Luke worked within the UPFORD partnership between Notre Dame and Uganda Martyr's University, researching the business skills of villagers involved in the SILC (Savings and Internal Lending Communities) in hopes of implementing business-skills trainings into SILC groups. SILC groups are grassroots savings associations that bring micro-finance to areas without access to the formal financial sector. Villagers pool their extra money into a common pool into which all members can apply to receive loans. He went door-to-door with his research partner to talk with people involved with SILC. His most enduring memories are of visiting so many different homes, asking survey questions, and sharing fruit and time! Alyce Kanabrocki majored in Environmental Science and Peace Studies. She spent the summer of 2012 in Adaklu Helekpe – a rural village in the southeastern part of Ghana – as a part of the International Summer Service Learning Program (ISSLP), sponsored by the Center for Social Concerns. Over two months, Alyce taught physics at a local secondary school, as well as did consulting work for a local NGO, the Adaklu Youth Education Committee. The most meaningful part of her two months was the acceptance and solidarity experienced with the people of Helekpe. After graduation, Alyce hoped to attend graduate school and participate in the Peace Corps through a Masters International program. Kristen Kelly majored in Anthropology with a minor in International Development Studies. She spent summers 2011 and 2012 conducting research on agricultural development initiatives in rural Uganda through the Kellogg Institute and Glynn Family Honors Program. Through her fieldwork, she sought to understand the impact of 12 community garden projects on individual and community life in the Nnindye Parish. In summer 2012, she also focused her research specifically on the role of women in agricultural development. Thanks to her experiences, Kristen has realized her passion for international development and has decided to dedicate her life to work in this field. Max Maier majored in Finance and Economics. In the Summer of 2012, he conducted research regarding the Value Chain of Matoke in the Nnindye Parish in Central Uganda. For those who do not know, Matoke is a form of banana which Ugandans harvest when ripe, mash up, steam, and eat! Max's research had him conducting interviews all over Central Uganda to attain as much information as possible on the production, transportation, and sale of Matoke in all of its forms and markets. His summer proved to be an unforgettable experience with many trials, tribulations, and certainly no shortage of laughter. Margot Morris majored in Anthropology with minors in French and International Development. In the summer of 2012, Margot Morris conducted mosquito net research with International Relief and Development (IRD) in Kampong Chhnang, Cambodia. She interviewed village women and observed IRD program activities promoting mother and child health. She traveled to villages on a motorbike and ate many lunches in people's homes. Outside of her research, she visited the ancient ruins of Angkor Wat, learned Khmer dancing and almost got attacked by a monkey! Margot wrote an Anthropology thesis and planned to pursue a career in international development. Margeaux Prinster spent 9 weeks in summer 2012 interning in Jodhpur, Rajasthan, India with the Foundation for Sustainable Development. Over the course of the summer, she conducted case-study research whose findings culminated in a training video for the female beneficiaries of Aastha Credit Co-Operative Society Ltd., a micro finance institution who aims to economically empower impoverished women. Aastha's Self-Help Group loan structure allows groups of 10 women to take out a group loan, invest that loan in a craft business together, and work together to accumulate not only enough money to repay the loan, but also to save additional profit to supplement their husbands' income. She continued her summer experience in 2013 by delving more deeply into the underlying cultural structures that produce issues of female disempowerment in traditional Indian society. Emma Richardson majored in Pre-Professional Science and Sociology at the University of Notre Dame. She interned with the Foundation for International Medical Relief of Children in Bumwalukani, Uganda through Notre Dame's Kellogg Internship. During her eight weeks in Uganda, she conducted an evaluation of the clinic's Community Health Educators program. Emma spent most of her time interviewing locals in the surrounding villages, but she also gave health education talks, assisted the clinicians, and visited other local medical facilities. Patrice Zigrossi studied French, Pre-Medical Studies, and Poverty Studies at the University of Notre Dame. She spent the summer of 2012 in M'Bour, Senegal, working in an orphanage and free clinic run by Vivre Ensemble, a French NGO. Patrice spent 8 weeks in Senegal, thanks to the International Summer Service Learning Program, sponsored by Notre Dame's Center for Social Concerns. Most of her time was spent in the Pouponnière, the section of the orphanage devoted to children under the age of 4. The Pouponnière takes care of children whose families are unable to care for them financially or who have been orphaned. Patrice's summer was dedicated to taking care of, playing with, and understanding the lives of these children. Patrice hopes to one day return to Senegal as a doctor with Médecins San Frontières.